A semicolon sits half way between a period/full stop and a comma. It has little or nothing to do with a colon, however. It is used instead of a period/full stop when we want to avoid too strong a break between phrases and instead of a comma when we need a stronger break. The participants will be: Eric, Terry, Neil, John, Graham, and Michael. When punctuating a series of phrases which include a comma, you should use semicolons instead of commas to separate the phrases from one another. Henry’s mother believes three things: that every situation, no matter how grim, will be happily resolved; that no one knows more about human nature than she; and that Henry, who is thirty-five years old, will never be able to do his own laundry. According to our records your son missed school on Monday, May 2nd; Thursday, May 5th; and Friday, May 6th. Semicolons can be used to join two sentences (or independent clauses) which are closely related. I saw a man on a plane. He looked the kind of man who would put fire out with flame. I saw a man on a plane; he looked the kind of man who would put fire out with flame. 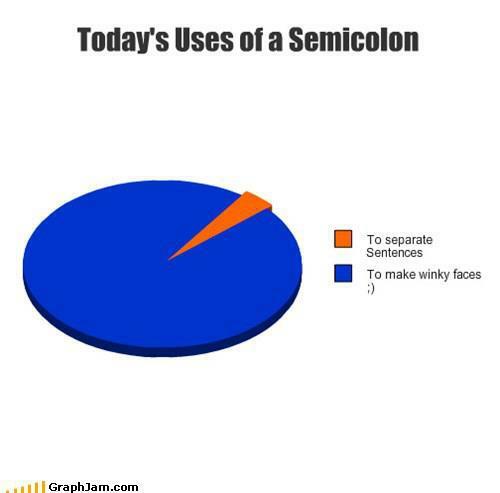 You can use a semicolon before conjunctions like therefore, however when joining two sentences‏‎. In this case the connector must be followed by a comma. I’m 100% positive I didn’t make any mistakes in my report; however, I’m willing to proofread it once more. Susanna arrived about twenty minutes before Julia; therefore, she is the winner. * I love beans; Queen Victoria was 1.52m tall. * I have been waiting a long time for my divorce to come through; but now I wish I never asked for it. I have been waiting a long time for my divorce to come through, but now I wish I never asked for it. I have been waiting a long time for my divorce, my terrible, long, divorce to come through; but now I wish I never asked for it. Do not link a dependent clause to an independent clause by way of a semicolon. * Although achieving good results with this method is possible; research shows it is unlikely. Although achieving good results with this method is possible, research shows it is unlikely.